When tragedy strikes your life as it did ours last August with the death of our son, priorities immediately need a re-grouping. Some projects or goals just seem to lose the “importance factor” that they once had. 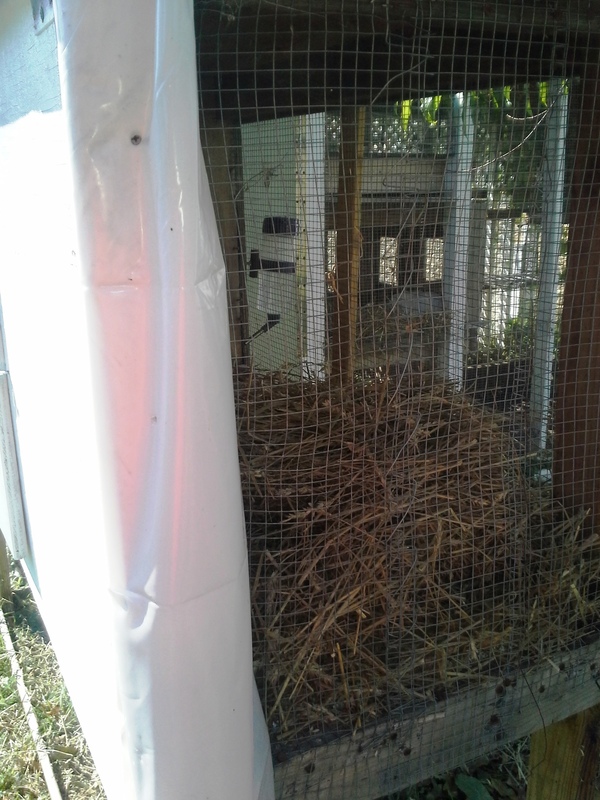 Our chicken coop, although way behind schedule, was not a project that could be dumped as we had new hatchlings ready to inhabit the expansive new home and run. Below is a video of the project to about 80% complete. New Coop 2.0 2016 from Stephen Luckett on Vimeo. Here are a few pictures of the completed yard and moving the hens from the old coop to join the new family of hens. We only finished one side of the run, but as the weather breaks in the next few weeks, we will get out and build the other side of the run. With a double run system, we can always keep one side growing in fresh fodder. Hopefully this will keep our hens happy and laying eggs for us on a regular basis. Just one little note, be very careful if you are going to have two roosters in an enclosed area. You could wake up to this! Neither rooster died, but you could not tell it from the amount of blood all over the coop. Although our priorities have changed and we are not as intent on our homesteading life, I intend to keep writing about our life here in suburbia. As a follower of Christ, God put man in charge of the gardens and the soil that abundance may grow to sustain our earthly life. We will do, as instructed by Him, including maintaining our greenhouse, aquaponic gardens, and apiary. And last night was a neighborhood barbeque! The dark meat toward the left is part of a deer roast from this past years trip to the cabin. From 4 hens in just 7 weeks after processing, we had a full 20 pounds of chicken meat! We still have the carcasses to turn into broth which we will can/freeze for future needs. As an added note, I will have to say that I am very proud of my wife who wanted to learn to process the chicken and did all 4 chickens herself. Good Job! Recent Projects…Like I don’t have enough to do! Getting the garden in place this year has been a real chore with the deluge of rain we have been getting in the Mid-Atlantic Region. So I have been filling my time, in between raindrops, doing a few little projects that needed done. 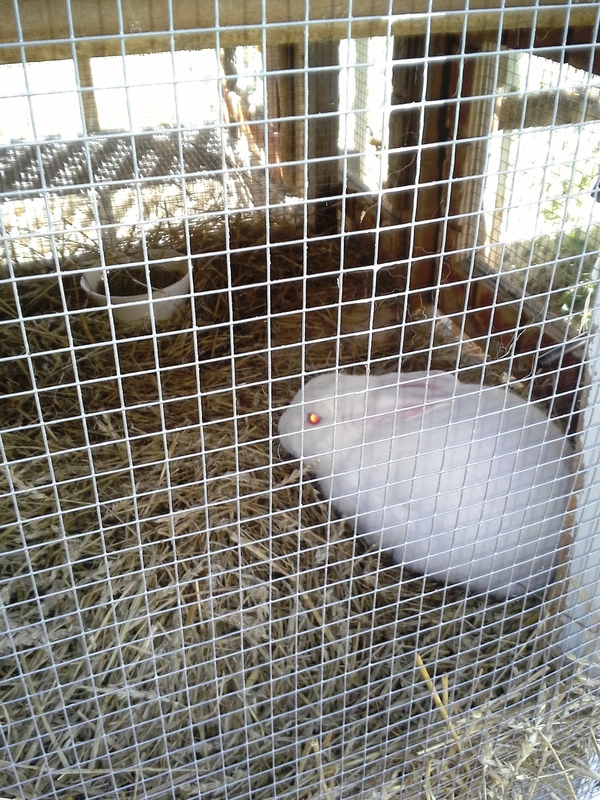 First we moved the rabbits out of the greenhouse into their own new digs. 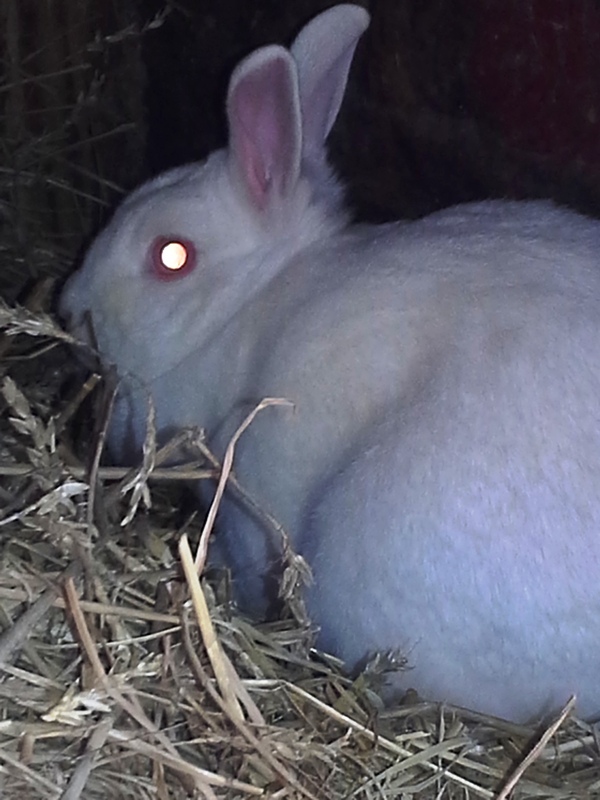 The housing use to belong to our chickens, but since we no longer can have them on our property (Thank you Baltimore County), it seemed like a great place to house our rabbits. I just needed to add a small rabbit condo to the mix. We always have extra wood laying around and in this case I had an old antique secretary desk that was beyond repair. This made for the perfect base and 2 floors for the new rabbit condo. All I really had to do was add a third level (we only have two female rabbits housed here) and some ramps for them to climb. Overall I think it turned out pretty good for just a few hours work. Next I had to take the new chickens-our 6 meat birds-and get them out of the house. They were getting too big too quick for the extra large dog cage we were using. We are going to dispatch them next weekend, so I only needed a couple more weeks. I moved them into the greenhouse where the rabbits were to keep them out of sight of our 1 problematic neighbor. They seem happier in the expanded space, I just hope no one tells them about our weekend plans! Another project I have been wanting to do was make some dedicated space for our potato crop. We have done ok with potatoes the last few years but I am horrible about adding to the hills as they grow, thus reducing my harvest. This year I decided to do as a friend of mine did last year: grow my potatoes in barrels! I cut three barrels in half, drilled in some drainage holes, and set them along the fence row where they will get plenty of sun all day. If you do this be sure to clean up all the little curly plastic or mama gets upset! Once having the barrels set, I mixed some our local dirt (clay), compost, and perlite to formulate a good bedding mix for the new potatoes. I scooped this into each barrel and leveled it at about 4 inches deep. This seemed a good starting point with potatoes. I did this a few days ago and I just looked into the barrels this morning and saw several of the potatoes growing. When they get to about 6-8 inches I will add more dirt, burying the plants to about 4 inches again. I have already made up an extra barrel of the dirt mix and have it standing by so hopefully I will add more each week to realize a larger potato crop. My friend that showed me this method got a great yield from his 1 barrel last year so I am real excited to see how this does for me. This is just a few of the projects I have done over this rainy period. The last few days, there have been enough dry spells to get the garden in, so I will have several updates in the coming days. There has been much debate in our household about adding to our flock. Needless to say….I lost! So now we have acquired 6 new Cornish Bard hens to add to our existing family of 10 hens & a rooster. Difference being that these are not egg produces but fast growing hens for meat production. The debate is whether after 10 weeks of feeding and caring for these hens that I can bring myself to butcher them for Sunday dinner. These are 4 days old currently. Oh well, I guess now it is just wait and see. If you have been following our bathroom remodel, sorry to say that it was put on hold for the last week. Although I do have at least one post to do about it, this week has been spent preparing for the inevitable Jonas Storm hitting the east coast. I am not a doomsday prepper, but I do seriously believe in prepping for the eventuality-nay reality-of natural disasters; like winter storm Jonas. It is not just about going to the local big box and buying up all the necessities: water, milk, bread, toilet paper, etc. Although these are good items to make sure you have on hand. There are a lot of other preparing depending on the disaster that is going to hit. It our case in Baltimore-Blizzard Jonas. Since our chicken coop is a mile from our house (due to local regulations), I went and took the time to wrap the entire coop in a heavy mil plastic to keep the majority of the snow at least outside. But with 60-70 mph wind gusts, I hope it will hold up. I did make it to the coop yesterday morning and it seemed to be fine, but the worst of the storm did not really hit until yesterday afternoon. I am stuck this morning-even 4-wheel drives are not moving for a while because of the 4-5ft snow drifts surrounding them. Next I concerned myself with the rabbits. Although rabbits handle cold well, I really did not want to worry about trudging through the snow to take care of them. So we decided to move them into the greenhouse. 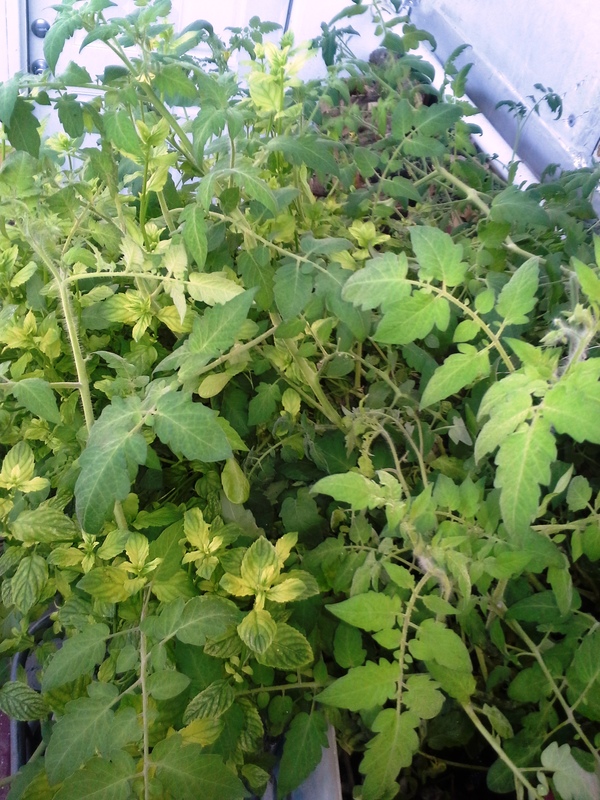 There is not really much room in the greenhouse, but I nestled them into the back corner, covering the rear entrance. We use this entrance very little and with snow piled outside, the likelihood of needing it was less. You can never have enough good batteries, especially if you get into a grid down situation. So on my stock up trip to Costco, I did buy extra batteries. I also made sure that my solar powered generators, batteries, and lights were fully charged. I love Goal Zero’s products, so I have most of their product line and solar panels. We do have a Honda gas fired generator, which I fueled and started just to make sure there were no issues. So in comes Jonas! I did everything I could to be ready, but it seems, there could always be more. I forgot to dig out my heavy hat, gloves, boots and scarves. It was not too bad rounding them up, but I could have had them out and ready. Spent most of yesterday transporting essential personnel. My wife is a nurse, so not going to work is not an option! I was hoping she would not get stuck there all weekend, but that all depended on transport picking up the personnel that could not drive in. They were able to get fully staffed so my wife was able to leave at the end of her regularly scheduled shift. But she did have to get a ride in this morning since my 4wd is plowed in! I did take a little time to dig out the greenhouse entrance so I could feed the rabbits and fish, as well as check on the aquaponics operation. Although it was nice and toasty in the greenhouse, I was a little concerned about the amount of snow laying on our windows. Since we used conservatory windows, they are not built to withstand holding that much weight. I thought starting a fire in the Rocket Mass Heater might help to melt it off a little quicker. The rest of my day was spent, shoveling and snow-blowing to insure that emergency personnel could get on our street if need be. The majority of my neighbors are either elderly or disabled, so it falls on the few of us able bodied to keep the road and driveways open to essential personnel. My neighbors son-in-law, my brother-in-law, and I dug out most houses on the street. We live on a short section of one-way street, so there are only 10 houses on the block. Out of the 10, we dug out 6 before the worst of the storm hit. At this point we had already had about 15-18 inches, so I thought it would make it easier on us this morning. Most of the work we did yesterday was gone! The winds, gusting up to 70mph, re-covered everything and pretty much buried any vehicle. There are a few people out shoveling, blowing now and I will join them soon, even though I am still trying to recover from yesterday. I do love snow but Baltimore ended in a new single snowfall record of 29.3 inches. Add the wind to the mix and this was definitely one of the worst storms to hit our area in my lifetime. We are looking at cloudy skies and sun for the next week, so we should be able to recover quickly and get Baltimore “open for business” again! It has been two months since I have shared anything. I thought it was only a few weeks, but regardless, not good for anyone blogging. These last two months have been so eventful and packed full of activities that it is hard to determine where to start. Of course, trying to get ready for winter has been a priority. Cleaning the little homestead, pulling up the garden beds, pruning trees and arbor, laying new wood chips around the garden paths, mulching trees to protect roots from winter, cleaning out aquaponics tanks, setting up greenhouse, readying the animals (rabbits, chickens, bees) etc, etc, etc. I have pictures and will post more later…. Fortunately so far this year it has been very mild for us. We have stayed pretty consistently in the 50’s and 60’s-a good 15-20 degrees above normal for the Mid-Atlantic Region. They are even calling for 72 degrees on Christmas Eve, with Christmas Day in the 60’s! It has given me some extra time at least to get our gardens and yard together. We have had a few health scares as well, both myself and my wife. My Melanoma keeps spreading, so keeping on top of it with my doctor has to be a priority. I was also diagnosed with C.O.P.D. not bad enough yet for oxygen, but fatigue and shortness of breath set in quickly. My wife ended up with the hospital with what they determined a cardiac “episode” I guess they determine an episode when they cannot truly find anything, but all symptoms seemed like a heart attack to me. AT least enough to transport by ambulance instead of taking a chance driving her. She is back to normal, just have to be sure to see a heart specialist after Christmas to, if nothing else, get baseline readings. Well, for now, I wish everyone a very Merry Christmas and Happy New Year. I will start posting more regularly again very soon! Preparing for winter-too much to do! I am taking advantage of the nice-but cool weather today to start preparing the suburban homestead for winter. Bees, chickens, rabbits, fish, the greenhouse, the aquaponics systems the garden, canning, freezing, dehydrating, and I am sure there are a few other things that will need my attention over the coming weeks. This morning started at 5:30, fixing breakfast for the little woman. Yes she still works outside the home, which is why I became here “Homestead Hero”, as she calls me. Hero I am not, but it is a full time job to take care of a homestead-even a small 1/5 acre suburban homestead. After getting her off to work, its time to gather food scraps and greens (grow in the garden and greenhouse) to feed the chickens. Taking food and water to the chickens is not as easy as walking out the back door since we can not legally keep fowl on our property. (In Baltimore County-must have 1 acre for any chickens) So I have to take a short drive of about 1 1/2 miles to get to the chicken coop on our friends property. This isn’t so bad and I really do not have to go every day since we installed the solar electric door to let them in and lock them up at night. But it’s nice to feed them greens and scraps to keep our feed bill low. Once back from the coop, I focused on getting the bees wrapped all warm and toasty. We have had a few nights now at 30 degrees, so why wait until the last minute. I start the wrap with a layer of 2″ foam board around three sides. This is held tight with a metal plumbing strap. 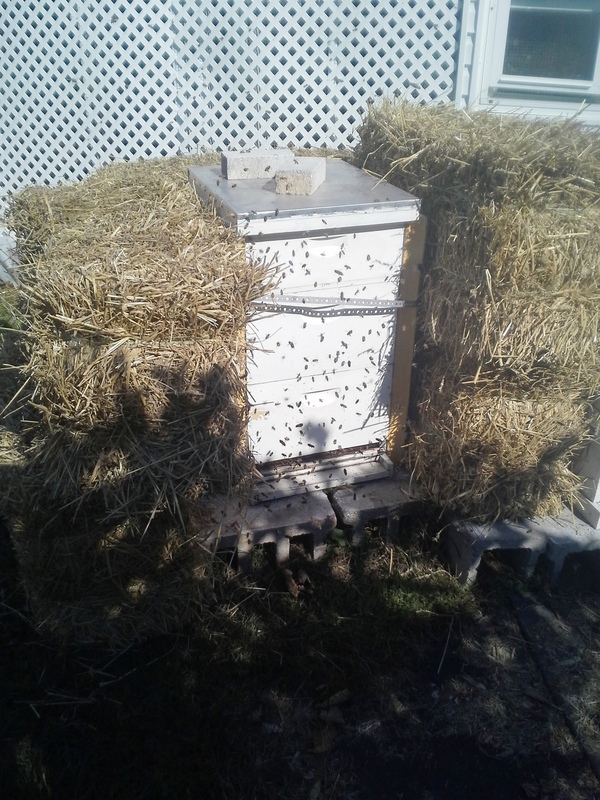 Then I can surround the hive with straw bales. These serve as a great wind break and an insulator for the cold weather accompanied by high winds that we usually have here on the east coast. 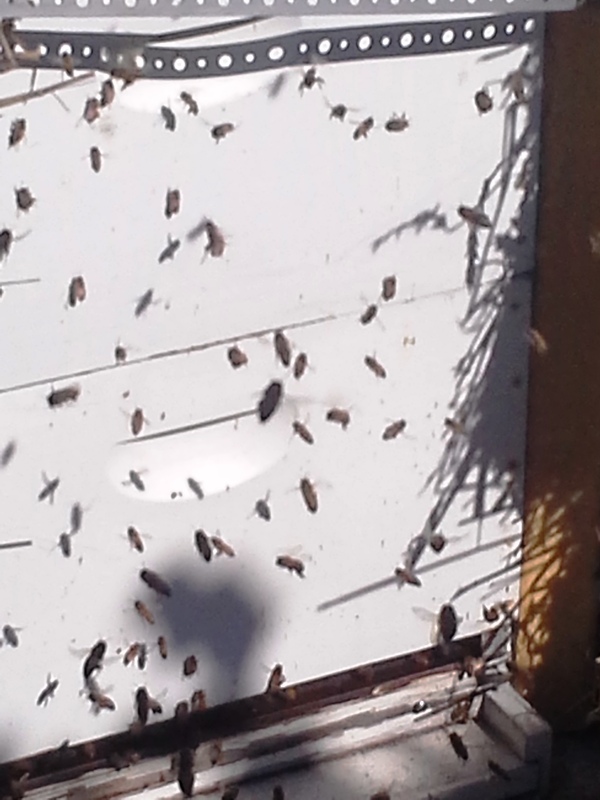 In the third picture, many of the bees came out to see what was going on, almost looks as if they are getting ready to swarm, but they quickly settled back inside to their routine. I was going to start feeding them today, but with the activity I will just wait until tomorrow before I disturb them again. While I was outside, I just checked on the rabbits. We have a mating pair of Florida Whites, of which our female is currently pregnant. She is due on the 27th, so I just added some straw in the cage so she could build a nice comfy warm nest to deliver the litter. I have the plastic wrap put up but have not surrounded the hutches with it yet. That only takes a few minutes to unroll and attached to the outside of the hutch, so I can wait until later this month. Our female-Sweet Pea, Just 7 more days to delivery! Chickens, bees, and rabbits-check, check, and check. So on to the greenhouse. I have not been real active in the greenhouse over the summer, since all of my attention has been devoted to the outside garden projects. Of course the last few weeks have been filled with canning, freezing and dehydrating our spring and summer crops. “crops” that makes it sound like we have so many acres, but we have just enough for one little homestead hero to handle. You would be amazed at how much can be grown on a 1/5 acre! Anyway, back to the greenhouse. 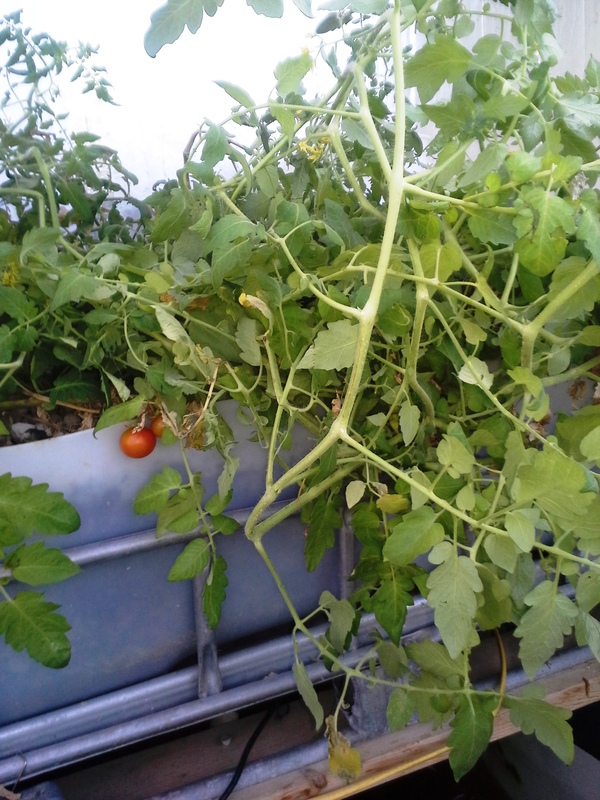 I wrote a couple of months ago about our cherry tomato plant in the aquaponic grow bed. I figured today was a good day to say goodbye to it-after 11 months of growing and fruiting. 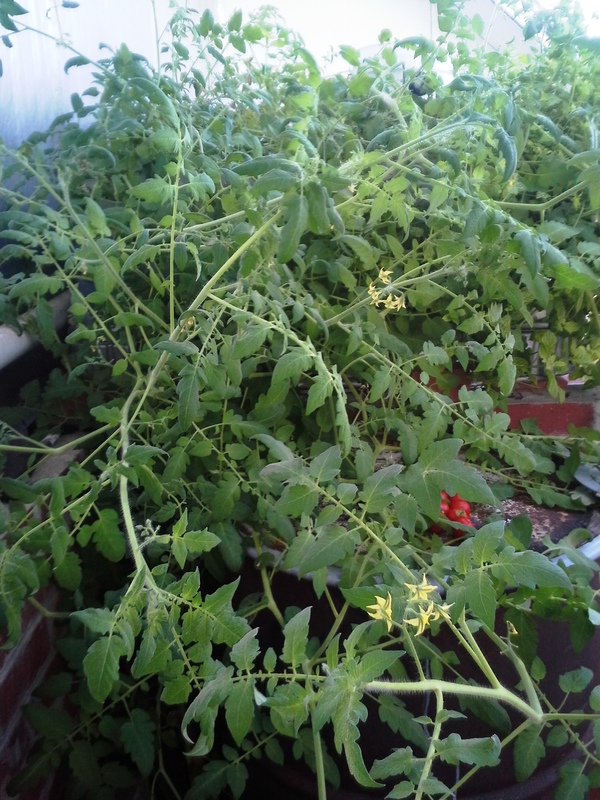 Yes it was still delivering cherry tomatoes, but the growth had taken over the greenhouse and the vines had rooted in several places throughout 2 grow beds. It took some time to clean out the remains of the tomato plant, along with some lettuce, spinach, and mint that the growth had been hiding from me. But now that the grow beds are empty, except for a thriving mint plant in one corner, I can start to plant for winter growth. 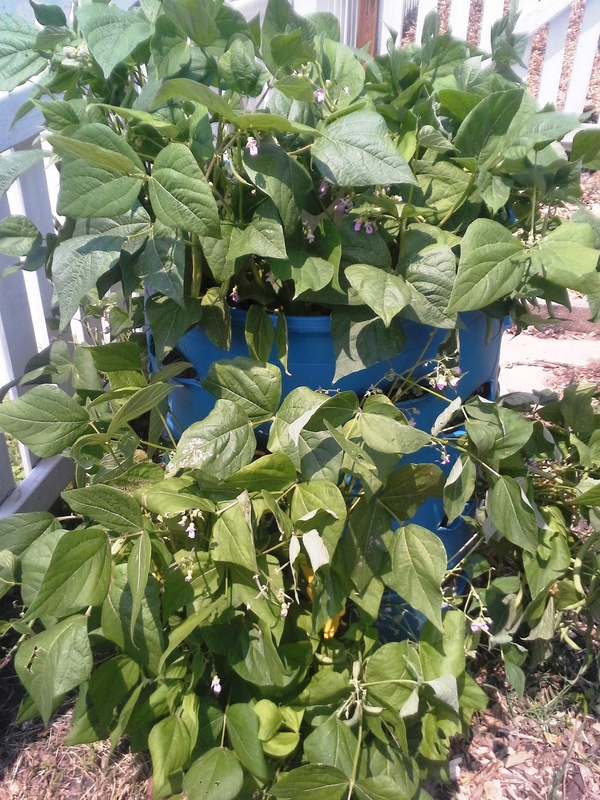 While working outside I found some bean plants that had sprouted around my outside grow tower. I guess when I let some stay on the vine to dry for use as seeds next year, they must have fallen off and germinated in the ground around the barrel. There were six small plants that seemed to be thriving, even after the frost we encountered the last two nights. 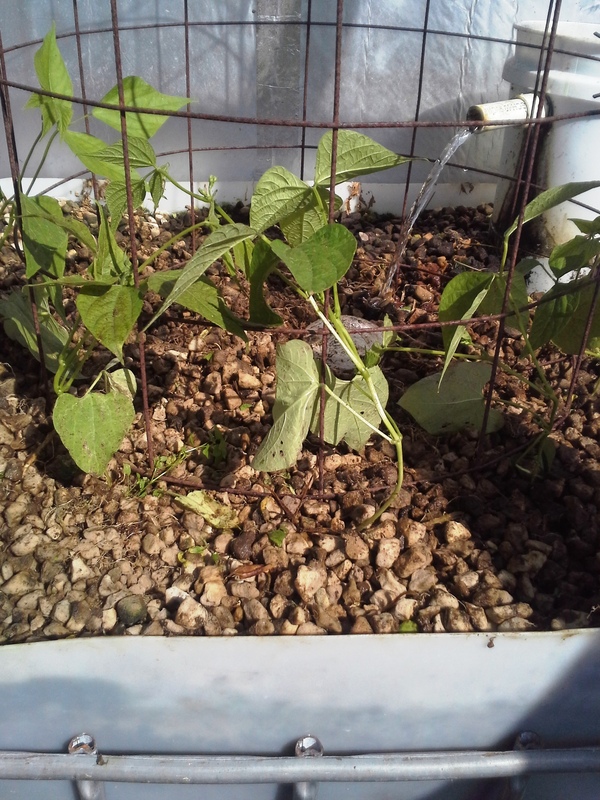 I thought this would be a perfect time to try green beans in our aquaponics system. 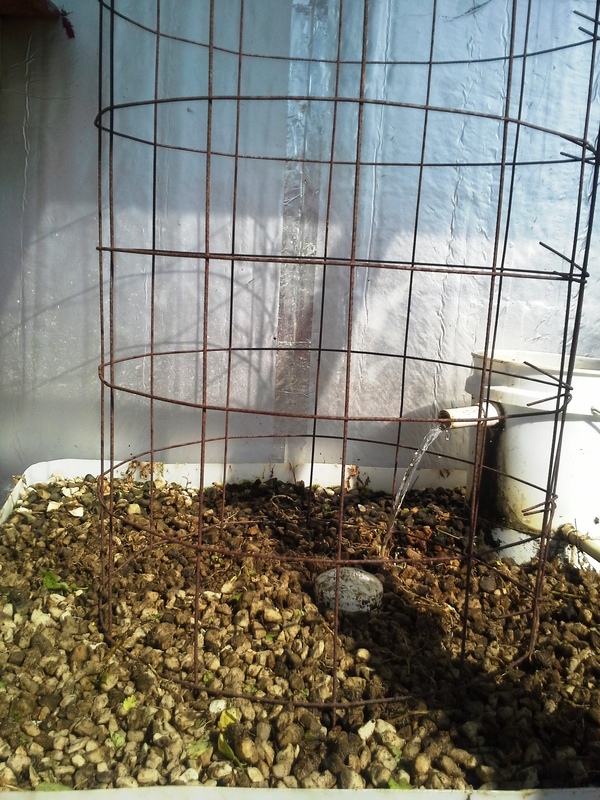 I installed one of our larger tomato cages into the center of the grow bed. 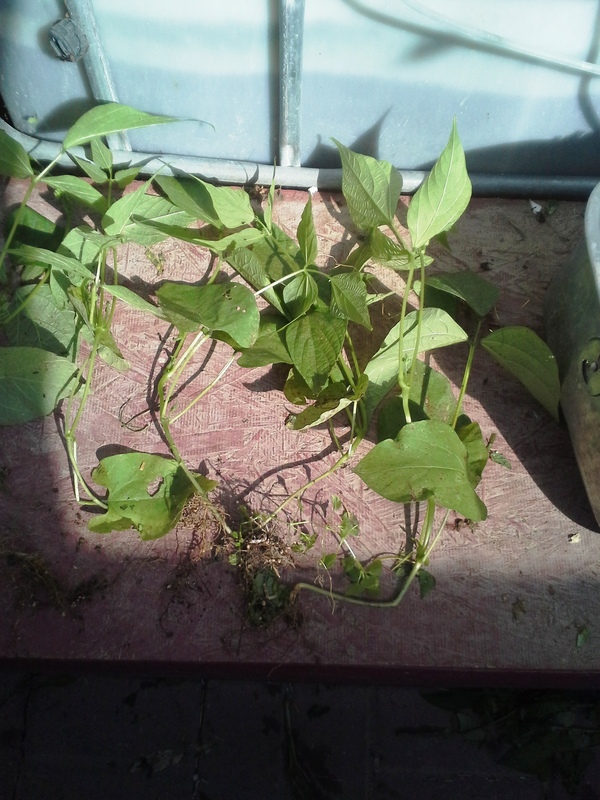 Then I dug up the 6 bean plants and cleaned the roots for transplanting. This will be a first for me trying green beans so I am excited to see how well they do. The other grow bed, with the mint in the corner is now planted with seed for lettuce, mescaline, spinach, and arugula. It is nice to be able in the winter to feed our chickens and rabbits fresh greens. 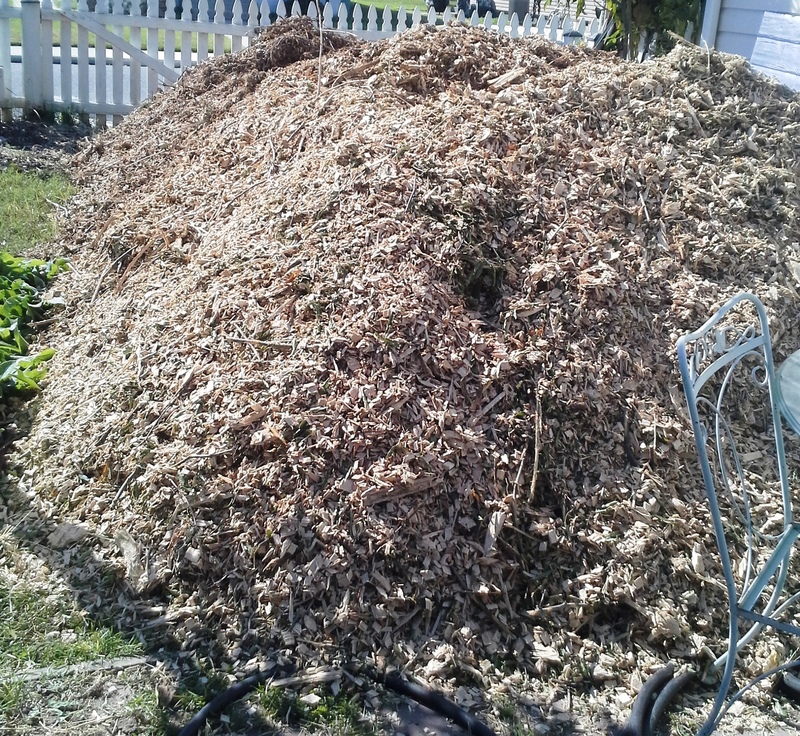 Part of preparing for winter is also thinking ahead to spring, so today I had a full load of wood chips delivered. I use these to spread on paths and walkways between the raised beds, as well as around fruit trees to keep roots warm in the winter. Anyone like pumpkins this time of year? 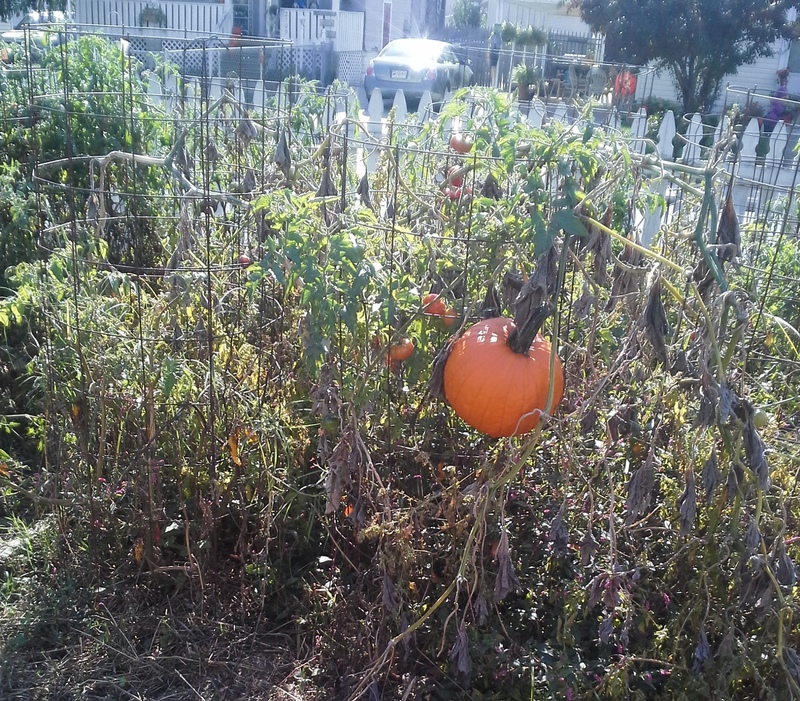 I did not plant pumpkins this year because it absolutely took over our garden beds last year. 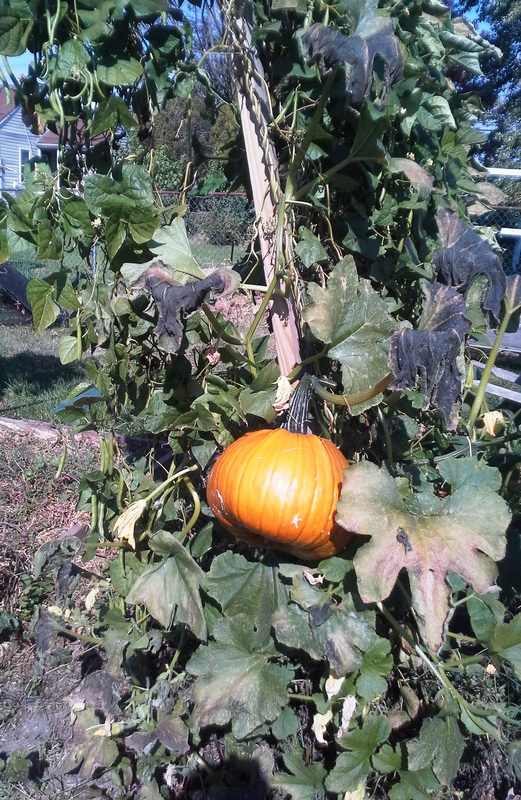 But I guess God had other plans for the garden this year as I have a great amount of pumpkins that grew. I think it fascinating that they are hanging from my tomato cages and green bean tunnel. 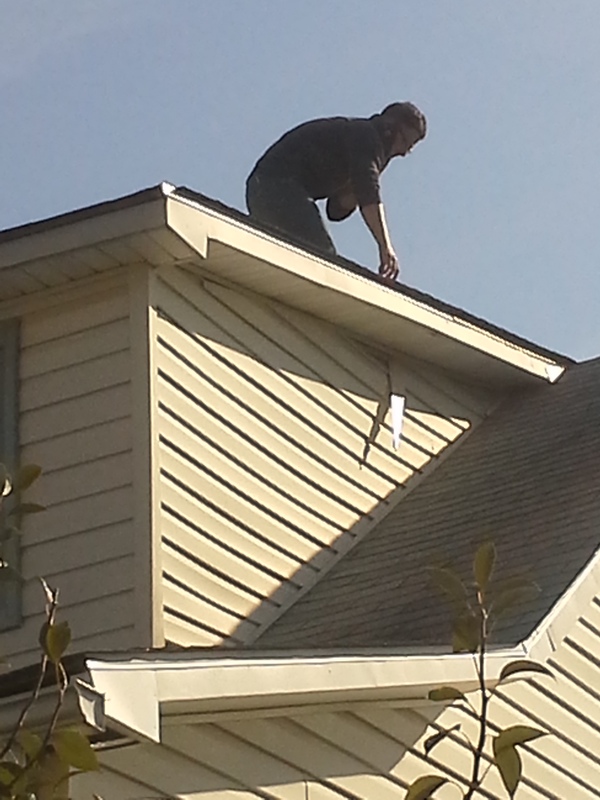 While working around the homestead today, I had an engineer here all morning checking, measuring, taking pictures and asking questions, readying our house for a solar panel installation. We are really looking forward to adding solar to our property, hopefully to help get our utility costs reduced and be more in line with our belief in sustainability and eco-friendly. I think this is the first time I have ever written over 1000 words for one post. I hope I did not bore you, but there is always a lot going on at the little suburban homestead this time of year. This hero, although tired, really enjoys the activity. Suburban Homesteading-A New Way of Life? Urban and suburban homesteading have grown beyond belief in the last decade. Many living in the city or near a city have chosen to be more self-sustainable through gardening, beekeeping, aquaponics, permaculture, and raising/breeding meat animals (rabbits, chicken). Not all inclusive, this list is considered by many, a new way to be more self-sustainable, more “green” in today’s world. Ready and planted garden beds for 2014 growing season. Being a part of suburban homesteading, doing all I can to make the best of our little 1/5 acre, has taught me many lessons. Among those is that this trend is not a new lifestyle- it is a reversion to the lifestyle of our ancestors. Our ancestors being self-sustainable out of necessity were really living a “green” lifestyle before green was cool! Our trip into homesteading began with two major forces driving our decisions, beginning with the economy, on to the need to house and feed more people under our roof. Economic conditions over the last decade have not been all the best, of course coming to a head in 2007-8 with the collapse of the housing market. This is when we truly became serious about be more self-sustainable. We have always gardened, but the amount of land dedicated to gardening grew substantially as more relatives (children and siblings) began to move back in with us due to lost jobs, lost homes, and health issues. As our population grew, the need to produce more of our own food grew. We quickly went from one main garden bed in our back yard to over 30 raised beds throughout the property. Growing our own food became a necessity, but we found that we had some much more control over what was going into our bodies. We chose to never again use any type of pesticide or herbicide within our property limits, determining that using natural substances made better sense and in many cases was more effective. Enter the chickens! Chicken manure is among the best “natural” fertilizers available, but having the actual chicken made so much more sense with the added value they bring to any yard and garden. The pecking, natural soil aeration, eliminating bugs and other pests, the eggs, and not to mention the shear joy of just watching them run and play in the yard made having them a no-brainer. Of course the County did not have the same opinion and took our chickens after a year because of local zoning regulations. More on this in other posts. So without chickens, we moved to rabbits. Choosing to raise meat rabbits at least gave us another great fertilizer source, but also another source of meat. There were no regulations on growing personal use rabbits, as well as we did not sell any, nor could we butcher any in public view. So at least we could still accomplish some of our goals without the County constantly in our business. As our garden grew, we felt a need to expand our ability to insure a good crop each year by adding bees to our little homestead. 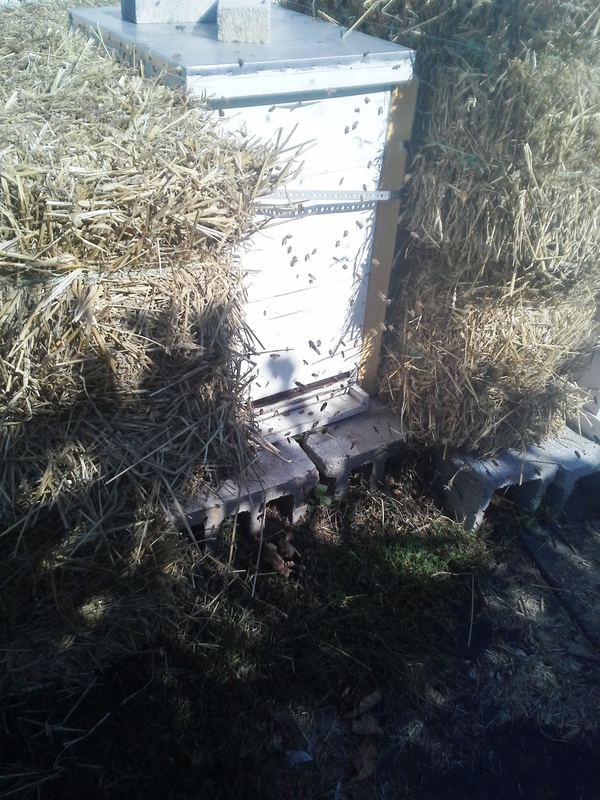 Seemed like a natural jump and fortunately we live in a county that has no regulations concerning beekeeping. Bees are an interesting lot and require little effort on the part of humans. If we provide proper housing for them, they are very attentive to their own needs to survive. This was a great step into our expanding homestead. 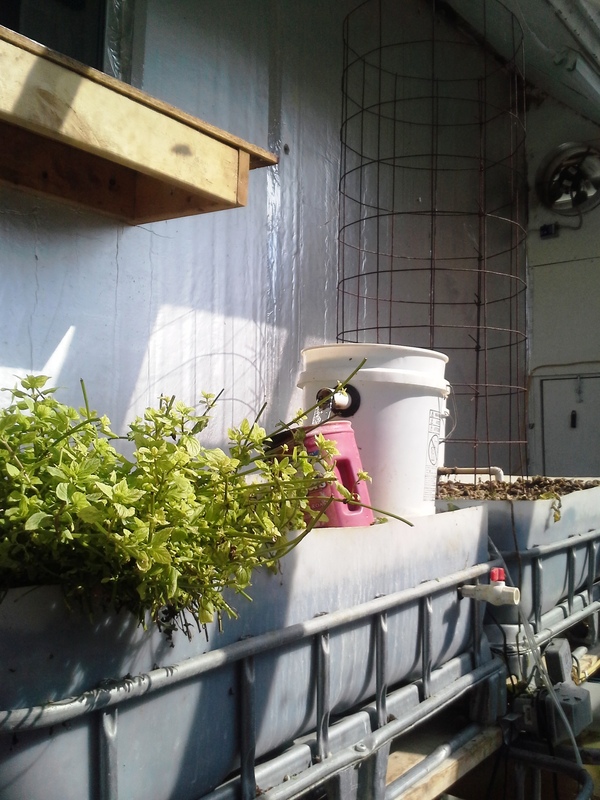 Extending our growing season for some fresh vegetables became a project last year, opting to try indoor aquaponics. Although this process had a huge learning curve for me, since I had no knowledge of fish or gardening without soil, we ventured forward. This has been one of the most enjoyable ventures so far and one that I was able to actually help fill a need to others in perfecting a “portable” AP system for other local enthusiast’s. This year was a major project year, deciding to build a 10′ x 20′ greenhouse to expand our growing season to year round and move our aquaponics into a larger area outside our basement. Again comes the County! This fight through multiple hearings, petitions, emails and phone calls finally came to an end in our favor after about 8 months. So we have been able to move forward and complete the structure, we are still very much in the set up phase of the interior. Of course how could I get through this post without thanking my parents and grand-parents for teaching me many of the skills I never thought I would use in my life. Canning, freezing, and dehydrating have become commonplace to extend our ability to use our own fresh crops, which I learned from my mother and grand-mother. Planting, growing, and harvesting knowledge are an extension of my father’s passed down skills. My grand-father taught me about chickens, cows, and horses-although our land could never accommodate large animals, I understood the value of chickens on our property. Every day is a joy to be able to get out of bed and do something I love that is a benefit to my family, my budget, and my community since we always have enough to spare to our elderly and disabled neighbors and our friends. Although my initial reasoning for our lifestyle had nothing to do with being more “green” I have found that many of the skills handed down to me are just that-a greener lifestyle. Self-sustainable and green can go hand in hand, but a” new” lifestyle it is not. Our ancestors understood a green lifestyle out of necessity, and passed down the knowledge and skills so future generations could enjoy the benefits of a self-sustaining lifestyle! 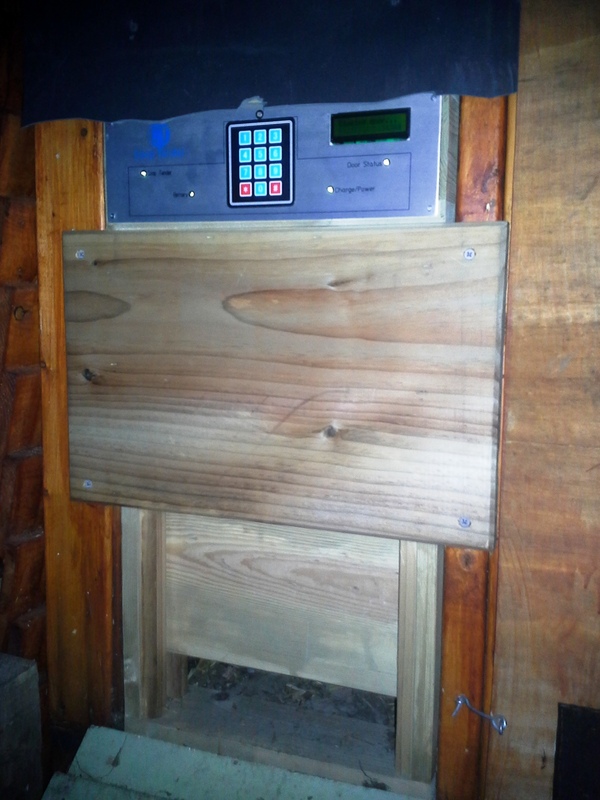 Well finally we have a working solar powered automatic chicken door! Just in time for the egg laying to begin. I posted a couple of months ago how excited I was to install our automatic chicken door. If you read the post, it was only a few days after installation that a big storm hit us and the chicken door got fried. The company, CoopTender, just outside Pittsburgh, was extremely helpful in trying to resolve the issues. They first had me send back the face plate which they replaced, but then found that the inverter, solar panel and battery were also fried. They ended up sending me a completely new door with all the add-ons. I installed the new door 4 days ago and it has worked like a charm each and every night. Although we are in a very shaded area, the panel gets enough daylight to keep the battery charged, so far. It is nice not having to run to the coop each morning and evening to make sure the girls are all tucked in. Of course the other excitement around the coop is most of the girls have started laying. I wrote a few days ago about our first eggs and how small they were, but production has increased along with the size of the eggs. We are currently getting 6-7 eggs a day. Our first flock was all production reds, so we only got brown eggs. This flock is a mix of easter eggers, leghorns, production reds, and a buff orpington. 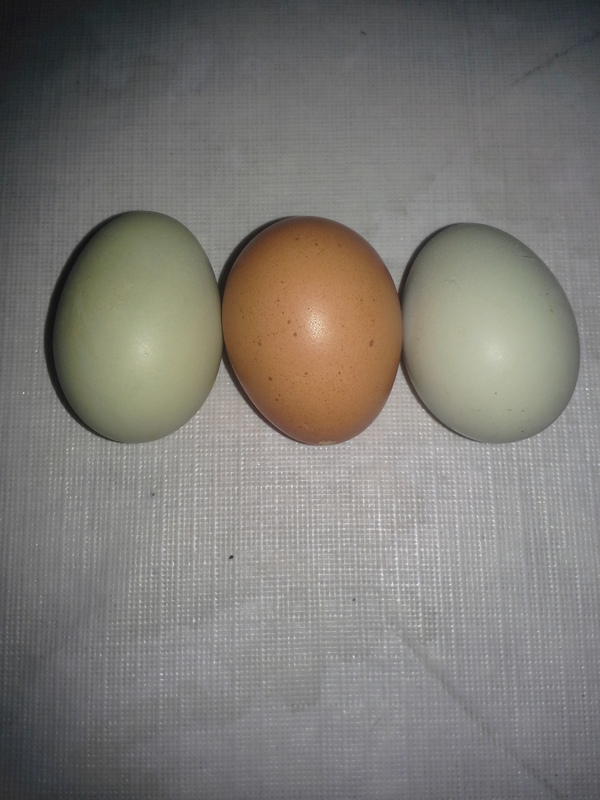 We are starting to get a real nice mix of white, tan, brown, blue, and green eggs. 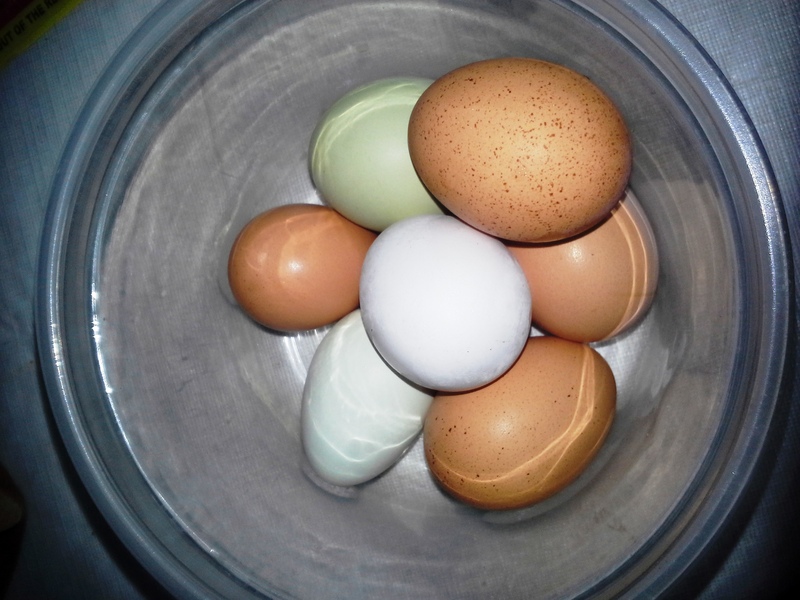 It is pretty neat to see the variety of colors, but I am surprised at the amount of our neighbors that are “afraid” of the eggs , especially the blue and green. Inside they are the same color and texture as any other egg, but I guess as the old saying goes “people are afraid of what they don’t understand”. I guess I will just have to schedule a community breakfast and invite everyone down for some eggs and bacon. Once they taste non-store bought eggs, they will truly understand the difference between store bought and free range, not to mention notice no difference in flavor because of the color of the shell. Great week in the Hen House! Well our girls are only 4 1/2 months old but for some reason they are starting to lay. The eggs are very small but I am guessing it is because I just started them on layer feed. I was not expecting any eggs for another 2 weeks or so. One of the Easter Eggers has layed twice and a production red, not wanting to be outdone I guess layed one yesterday.